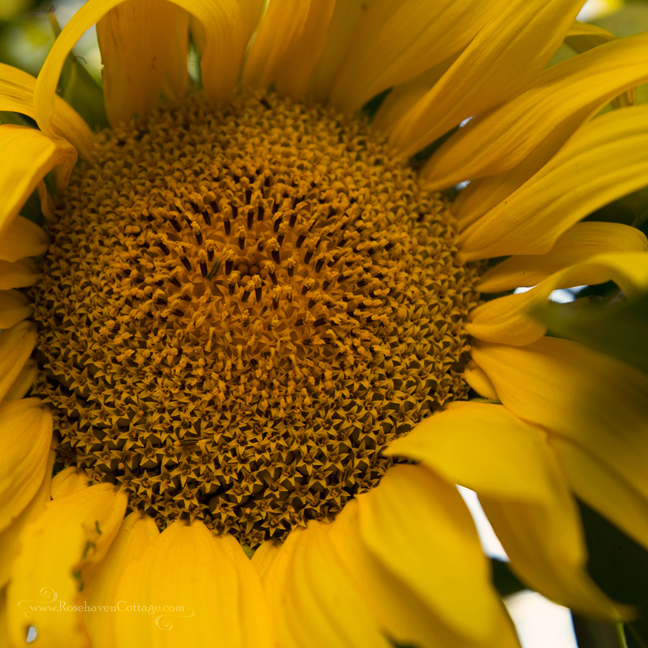 Have you ever looked at the center of a sunflower... really looked? It's made up of tiny little flowers--golden stars so small you can't see them unless you look closely. It takes so many to make up the center. And each one becomes a seed someday. 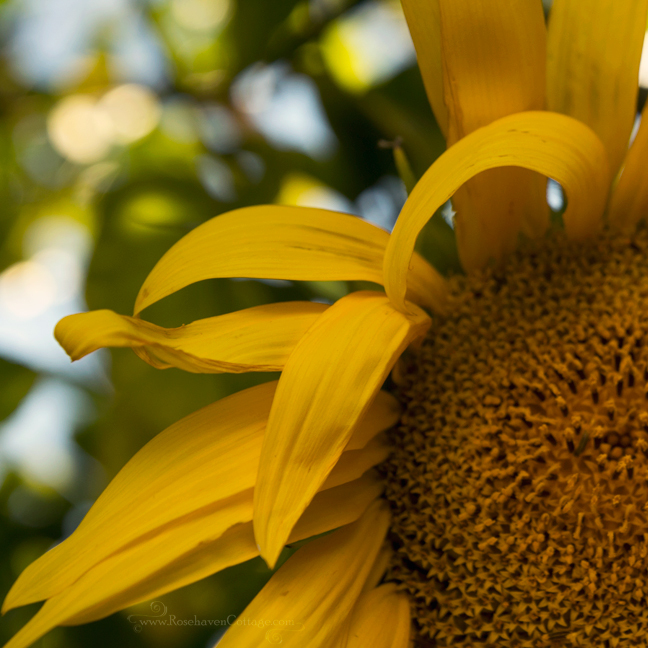 Have you taken the time to stroke a sunflower petal gently between your fingers? It's soft and thin but supple and alive. It feels warm yet cool at the same time. How is that possible? Have you stopped to realize that even though a bug has chewed a hole in some of the petals of a sunflower it's still incredibly beautiful? It doesn't matter that technically it's "flawed". It's beautiful. It epitomizes an entire season of the year. It can brighten someone's day in an instant. And it can do all this even with slight imperfections. This particular bloom grew up into the branches of the Eureka lemon tree. 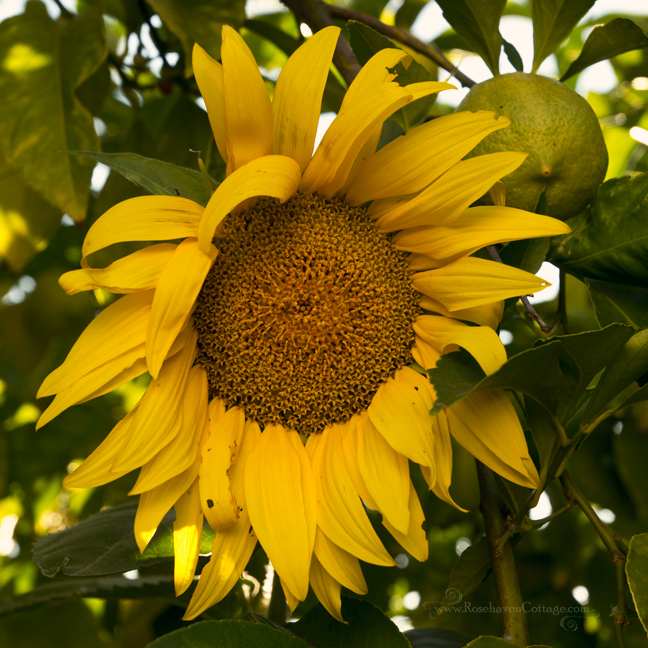 With the support of the tree, the giant head of the sunflower didn't weigh down the stem. It never leaned over under the weight and held it's head up high even as the bloom began to fade. 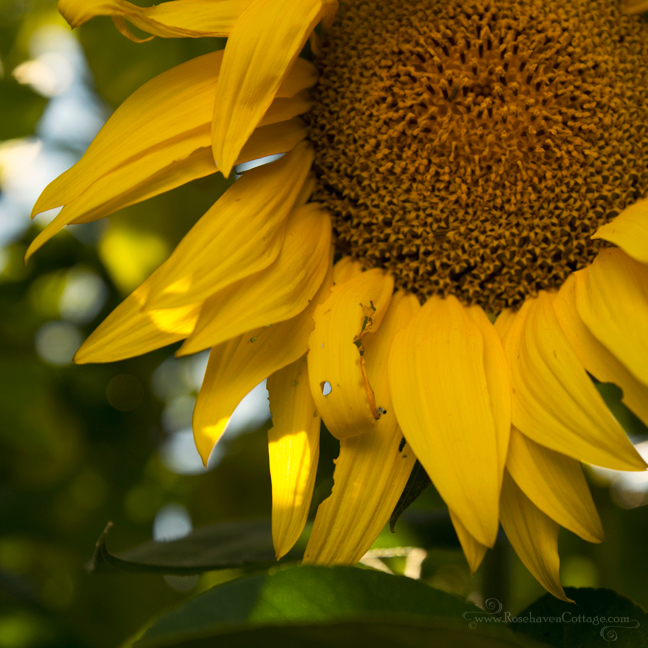 So many lessons I can learn from the sunflower. Lovely post and beautiful photos Cindy! Lessons, and learning, and is that really a lime in the background, a lime? See, we don't have them here, so I still find that amazing. Did you know that pi has something to do with the way the seeds are laid out in a circular form on the sunflower, sorry, rushed, can't remember but it's something to do with the golden mean. Doesn't that sound random, going to have to give a larger slice of my pie chart to thinking through my comments. My mom has a couple growing in her garden. I think I'll go give them a little attention.